Beautiful, delicious cakes, and excellent, personalized service. Highly recommend!! I wanted just a small 6” birthday cake that not everyone will make. I contacted Uniquely Cakes to see if she was willing to make a 3 layer cake in Lemon Raspberry. She not only made a deliciously moist lemon cake with raspberry filling, but it was 4 layers. It was ready to pick up at the time requested. I had planned my wedding remotely (from Chicago), so all communication was via email. Uniquely Cakes was incredible to work with - responsive, cooperative and professional. The cake was exactly what I wanted and tasted fantastic. Everyone at the wedding raved about the flavor, and my dad had FOUR slices of cake! It was just delicious. Thank you, Rochelle. I wish you were based in Chicago. Rochelle did a fabulous job creating our wedding cake. The cake was so soft and delicious, her buttercream icing is phenomenal, and the final product was exactly how we envisioned it! She was so pleasant to work with from start to finish, and happily accommodated our special requests. I highly recommend asking Rochelle to execute the cake of your dreams! We were very happy with the cakes that Uniquely Cakes made for our 50th wedding anniversary celebration. Rochelle advised us well on the amount of cake that we needed and charged a reasonable price. The cakes were all delicious. It was hard to decide which of the 3 flavors we liked best! The cake was amazing. Super moist and delicious! I HIGHLY recommend the red velvet! We ran out of it the quickest. 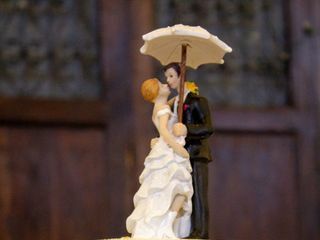 Everyone at the wedding was raving about the cake, even the venue staff who have wedding cake all summer! One of the venue staff members said it was the best wedding cake she has ever had, so I think that speaks volumes about the quality of the cake! We had a three-tiered cake with three different flavors (chocolate, lemon-poppy, and carrot). 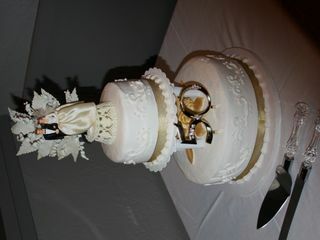 She even had a cake stand that we rented for the event and that was the perfect size for the cake. The best part is the value. The cake was much cheaper than some options at higher-end bakeries in Portland, OR. SUCH a great value! I'm so delighted to recommend Rochelle and Uniquely Cakes. Rochelle is so personable and easy to work with. We had a tasting of three of her cakes which were moist, light and flavorful. She was very interested in getting our cake just the way we visualized it. Our cake was perfect for our 50th Wedding Anniversary. 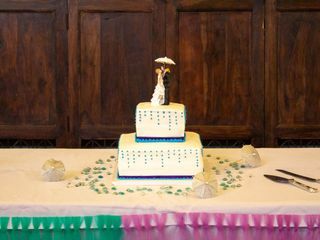 Our original cake top from 50 years ago was used and it added to our special memories of our wedding so many years ago. Our family members loved the flavors of the cake and remarked on how delicious it was. The best cake we have every ate. It is a family tradition to have your yummy cakes at our celebrations. Cant wait for the next time. Rochelle's cakes are amazing. The quality is truly unbelievable. Great cake! Flavorful, moist, and beautifully decorated! First off... I would consider myself a pretty good Baker and Rochelle takes baking cakes beyond this world. Best icing and frosting best fillings best cake super moist couldn't ask for anything better! Printing was very comparable for Salem. This lady has a treasure for cakes!!! Her cake was amazing!!!! Everyone commented on how good the cake was and they even had seconds. I bought some extra cake too and it was almost gone. I could not believe it! She also was very reasonable too. A very special lady. You will not be disappointed. Rochelle made the most beautiful and delicious wedding cake for our special day! We are beyond thrilled about the final outcome, the appearance, flavor and great experience. 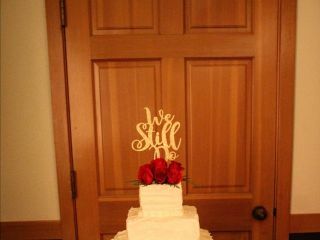 We couldn't be happier and so thankful we found Uniquely Cakes! We got numerous compliments from our guests and the cake was almost gone because it was such a hit. When selecting our vendors for our wedding, everyone knew about Uniquely Cakes and said we were in great hands. I would highly recommend Uniquely Cakes to everyone and can confirm you will have wonderful and tasty results! Uniquely cakes provided an amazing wedding cake! I can't wait to eat it again at our 1 year anniversary! Was extremely pleased with overall experience! Delicious, not a crumb left! The cake was beautiful, delivered on time, set up perfectly! Rochelle was great to work with, responding to my first cake inquiry quickly and agreeing to meet with us two days before Christmas to taste cake. Her portfolio provided us with many choices and we were able to choose the perfect cake. I highly recommend Uniquely Cakes. Rochelle is AMAZING! She made our wedding cake as well as a groom's cake, and we were thrilled with both of them! Her cakes are both BEAUTIFUL and so moist and delicious! I highly recommend her!! Rochelle was excellent to work with. Very professional and willing to accommodate special needs for the cake design. My sister and I had Rochelle make our parents 50th wedding anniversary cake. We had a picture of what we wanted it to look similar too. And she had some great ideas to add to it. She delivered the cake at the specified time and it was beautiful! No worries on our part. She has also made a wedding shower cake for me. She is very professional and easy to work with. She knows her stuff! I would have no problem having her make a cake for me for another event. Rochelle makes the most beautiful AND best tasting cakes my husband and I have ever tried! She's simply the best. Very accommodating and flexible as well. Would give her a 10! Rochelle's cakes are not only beautiful but taste delicious! She is friendly, professional and helped make our day special with her creativity and design! Rochelle did an amazing job with the cake. The flavors were wonderful and the final display was exactly what I had pictured! Thank you! Wonderful experience, beautiful cake at an amazing price! She took a huge stressor off my shoulders in planning my wedding and even gave advice on other segments of my decor. Rochelle's cake was gorgeous and absolutely delicious, and as the bride I didn't have to do anything other than try the samples and choose the flavor/design. She was completely flexible with delivery and setup when my reception logistics became a little crazy, and cooperated very smoothly with my florist on getting the decor flowers for the cake taken care of. Beautiful & sublimely delicious cakes at nearly half the price of the other vendors I'd contacted! 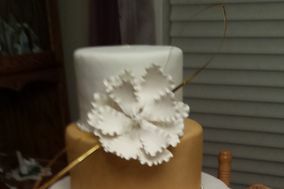 I was thrilled to find Rochelle of Uniquely Cakes for my daughter's wedding, and blessed too, because she graciously agreed to do our cakes on short notice even though she was already booked for our date! She is so kind and easy to work with. The positive reviews on her website were what caught my attention, and she more than lived up to them. We ordered a different flavor cake & filling for each layer. The champagne cake was DIVINE, and the caramel praline was scrumptious! I thoroughly intend on ordering special occasion cakes from Rochelle again, and heartily recommend Uniquely Cakes to everyone I know.